If you think snow would keep a triathlete from competing, you’d be wrong. Since 1997, something called winter triathlon has been gaining popularity among those people who want the thrill of the triathlon even though they live in areas where temperatures routinely hover near the freezing mark. “In winter triathlon, the running is contested on hard-packed snow courses (usually packed ski trails) with distances ranging from 5-9K. Racers typically wear normal running shoes or cross country spikes. The mountain bike leg is held on packed ski trails for a distance of 10-15K. Competitors ride standard racing mountain bikes, often equipped with relatively wide tires run at low (about 15-20 psi) pressure. Tires with spikes are legal, though most competitors shun their use because of the additional weight. If I’ve piqued your interest, you’ll naturally want to know where you can sign up for one of these awesome races. 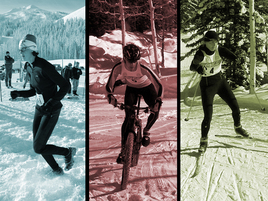 Most are held in the Rocky Mountain area, but races in the Northeast can also be found. There’s two being held in Massachusetts and another in New Hampshire in January. (Info can be found here.) In New York, the place to be is Belleayre Mountain on March 20th. So, see, there’s still time to train! This entry was posted on November 23, 2010 at 8:57 am and is filed under Upcoming Races. You can follow any responses to this entry through the RSS 2.0 feed. You can leave a response, or trackback from your own site.